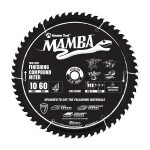 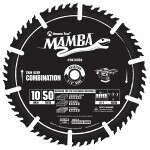 While these blades handle general trimming and crosscutting of hardwood and softwood, plywood and co..
Carbide Tipped Thin Kerf Ripping Mamba Contractor Series 8-8-1/4 Inch Dia x 24T, FT, 15 Deg, 5/8 Bor.. 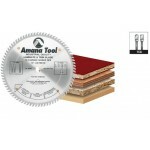 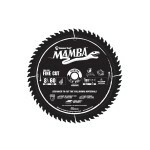 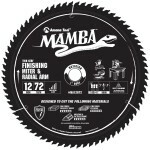 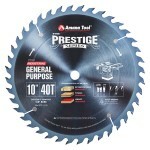 The Amana Tool® Presitge™ general-purpose blade cuts smoother and stays sharper, for longer, in ..
Aaman Tool Industrial Grade M-2 High Speed Steel for long runs in soft and hardwood. 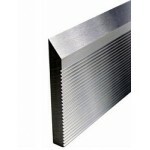 Hi..
Carbide Tipped Thin Kerf Fine Cut Mamba Contractor Series 8-1/2 Inch Dia x 60T, ATB+F, 8 Deg, 5/8 Bo..
Carbide Tipped Thin Kerf Combination Mamba Contractor Series 10 Inch Dia x 50T, 4+1, 15 Deg, 5/8 Bor..
Carbide Tipped Thin Kerf Finishing Compound Miter Mamba Contractor Series 10 Inch Dia x 60T, ATB+F, ..
Carbide Tipped Thin Kerf Non-Ferrous, Plastic & PVC Mamba Contractor Series 10 Inch Dia x 80T, T..
Carbide Tipped Thin Kerf General Purpose Miter Mamba Contractor Series 12 Inch Dia x 45T, ATB+F, 15 ..
Carbide Tipped Thin Kerf Finishing Compound Miter Mamba Contractor Series 12 Inch Dia x 72T, ATB+F, ..